Then the other day, I had a revelation… I say "dawdling" a lot. A lot. Usually directed at or about Miss M and Miss K. As in "Girls, quit dawdling and eat your dinner." "Girls, quit dawdling and get dressed." "Hurry up, you're dawdling." I'm certain DH could provide me a list of other words I use ad infinitum but I say this one so much that even I realized it. Did I mention that I say it a lot? Do you know what your word is? Have you ever thought about walking out onto your 4" snow-covered back porch, barefoot, in the middle of the night in nothing but your pajamas? The origin of that question will be clear in just a bit. DH and I are definitely dog people. Shortly after moving to California in 1995, we adopted Blizzard, a beautiful male American Eskimo. We fell so much in love with the breed that we decided to adopt a female, Glacier, so that Blizzard had another dog for companionship. Eventually, we found ourselves getting involved in animal rescue – helping rehabilitate dogs in our home until they were ready to move on to a permanent family. We were limited by the animal control laws to only three pets so we would foster a dog, work with it and find it a home before taking in another. One dog had behavioral problems; another was just a wanderer that needed to be cleaned up and fed before being placed in a home. A third, a female Chow whom we decided to call Nestle, was a special case. In 1997, she was just a puppy when we found her running as fast as her little feet would carry her - straight down the middle of a busy road in Palmdale, California. We had just headed out to hit some yard sales, so it was very early and thankfully traffic was scarce. We drove as close as we could to her and I jumped out in a feeble attempt to grab her. Being the spring chicken that I was (ha! ), she totally outran me. DH managed to safely get the car in front of her, threw it in park and jumped out to scare her off of the road. She got caught in a bush on the side of the road and we were able to wrangle her into the car. She had signs of having been abused by the man of her prior home; she wouldn't go near DH for months. Whenever he would stand up or raise an arm to pet her, she would cower in fear. It was a sad sight because she's a very gentle and loving creature. I never will understand how people can treat such caring and forgiving animals so cruelly. When it came time to take Nestle to an adoption event, I decided I couldn't do it. We had worked with her long enough that I realized that WE were the perfect family for her. Because of the three pet limit, our days of fostering and rehabilitating were over… but it was all for the best. We've been through a lot with our dogs. After many years of dealing with infertility issues, we had finally come to grips with the fact that our dogs were the only children we would ever have. (That was before we were blessed with Miss M.) Later, in 2004, Glacier had surgery to remove one of her eyes due to a tumor. We lost our first four-legged child, Blizzard, in December 2006. I didn't realize how incredibly hard that would hit me; it is still a difficult subject more than a year later. A few weeks ago, Nestle started having problems with one of her hind legs. She couldn't manage the flight of stairs so DH and I began to carry her up and down. It gave me flashbacks to all the time I needed to do that for Blizzard. But we love our dogs and we do what we need to. Nestle must have hurt it on something because she's finally started to put some weight on it and only needs help with the stairs about once per day. Then the other night, during our regular middle-of-the-night doggie restroom break, Nestle slipped trying to come up the three stairs to the porch. Her front paws were on the top pulling with all her might. She looked like she was falling off the side of a building – so helpless and panicked. Immediately, I realized that I needed to go outside… onto the back porch… barefoot into 4" of snow… in the middle of the night… in nothing but my pajamas to help her. As I opened the door to go outside, she mustered just enough strength to make it up by herself. Without hesitation, I gladly carried her up the flight of stairs to the bedroom. After reading the dictionary request that Heather made today, I laughed and mentioned it to my husband. Generally, I don't air my grievances with him on my blog but I agree that the "Duhsband" things he does or says are fair game… In our case, the act or statement is usually followed by me yelling "Don't teach the kids THAT." As I mentioned in my comment on her post, DH pointed out the other day that my newest threatening phrase is "Be careful what you say, you may end up as a blog post." Case in point… today while I was eating lunch and trying to read the paper, DH decided to try to get the kids riled up. Sidebar. I just had an Aha! Moment… seems that DH gets into the most mischief with our girls while I am in the process of attempting to consume food. (No jokes on how often I'm actually consuming food.) End sidebar. The girls started giggling; I looked up from the paper and DH, who had been hovering near me, jumped away. I think he was putting rabbit ears on me. This continued for a few minutes, off and on. As I attempted to swat him away like a fly, he said "Hey girls, watch how I make Mom mad." He then proceeded to wave his hands all around my head hollering "Air is free! Air is free!" "Arrghh! Stop that! Don't teach the girls that!" Then in a sinister voice, he looks back at the girls (who are about to choke from laughing while eating their mac and cheese), says "watch this" and puts his finger in his mouth. I have two brothers and know full well that the finger-in-the-mouth motion requires immediate defensive maneuvers. Thank goodness I was wearing a sweatshirt that was baggy enough to pull up to cover my ears… while I was simultaneously yelling "DON'T teach the girls THAT!" As he walked away, he said "I know; I'm going to end up being a blog post. Why don't you call it Air is NOT free." And here we are. At least he's fun and knows how to be silly, so I really can't complain. He really is the best. I generally try to keep my blog focused on personal, individualized content... but occasionally, something on another site strikes a chord and I just want to pass it along. When DH forwarded me a link to the Evil Mad Scientist site demonstrating how to make edible googly eyes, I was in awe. In a few years, my kids will be doing the whole Girl Scout thing as well as needing cool ideas for school treats so learning some of these tricks may come in handy in the future. I grew up in Iowa and took for granted that steaks are pretty tasty. When I moved to Los Angeles, I realized that not all steaks are created equal - if you wanted a good steak in LA, you really needed to find the nearest Ruth's Chris or Morton's. Granted, there are other steakhouse chains that had decent steaks, but to truly understand what a great steak is, you just need to fly to Iowa and experience it for yourself. For Christmas one year, my mom and dad actually purchased a freezer for us so we could have an Iowa side of beef shipped to us. About that time, I (finally) got pregnant and beef was absolutely on the bottom of my list of tastebud pleasers. In fact, I had a tough time with many meats and significantly reduced the amount I consumed of each. My poor brain continually tried to remind me that I'm not a vegetarian but pregnancy tastebuds will win every time. Needless to say, we didn't place that order for the Iowa beef. It didn't come up in discussion again until we started talking about moving back. DH is the grill chef of the family and we were both perfectly happy every time a plain ol' steak came off the grill. It was such an improvement over what we had been eating in California that nothing needed to be done to make them taste good. I'm not sure what compelled him to search for recipes/techniques or if he just stumbled upon it, but he found a post titled "How to Turn Cheap Choice Steaks into Gucci Prime Steaks" on the Steamy Kitchen blog. You absolutely have to read her post because I'll never be able to explain all the technical aspects of it and, as a bonus, she's a hoot. To paraphrase, you salt the steak A LOT for about an hour before cooking it. The result is a very tender, slightly salty steak that doesn't need to be slathered in A-1, 57 or any other letter/number combination steak stuff. Unfortunately, you may find that you want steak on the menu more often. Since discovering the recipe, we've used this technique about 30 times and shared it with anyone who will listen. Basically, depending on the thickness of your steak, you adjust the technique slightly. Our steaks are typically 1¼" so we heavily salt each side and let it sit on the counter for one hour. This is a perfect amount of time because we've found that a steak should be allowed to rest (come to room temperature) for about an hour before grilling it anyhow. We had a few opportunities to try it on ¾" cuts and decided that it was best to only salt one side of the steak in those instances. After the rest period, thoroughly rinse the steak off and pat it dry before sending it off to the grill. During these winter months when we're freezing our tails off, shoveling snow or simply not enjoying the subzero wind chill, I remind myself that Iowa does bring some advantages with it… then I head to the freezer to pull out a steak. Late last night, I was monkeying around with FeedBurner to change my RSS feed. I spent quite a bit of time reading about Atom, RSS and XML. Found out about a ton of different RSS reader services (I personally use Google Reader and love it), and generally experimented with some changes to the blog. FeedBurner has a bunch of fancy features and I'm excited about learning what it has to offer. I tried changing the template around some, too. There were a few bumps in the road that needed to be smoothed out, but I think (we) eventually got there. What resulted was a long conversation with DH about my blog and the technical aspects behind the RSS feed. It was an enjoyable conversation and I actually felt like my brain was working. Being a SAHM, I don't get a lot of deep thought-provoking technical issues to deal with. The blog has been an opportunity for me to really push myself to learn something new. And thank goodness that DH is sharp when it comes to computer stuff. What he doesn't know, he reads about and quickly absorbs. Tech Support available just one room away for all those times when I goof things up on my computer. I'm learning, little by little, and that's what counts. Eventually, when I decide I want to return to work, I won't feel like I spent the child raising years eating bon bons and watching information and technology pass me by. Thanks DH for all your help and encouragement! PS: This is my first new post since switching to the FeedBurner RSS - hope it makes it to everyone safe and sound! I'm in the process of trying to implement FeedBurner (yet another member of the Google family) and am about to change my settings. It's my first attempt at such a customization so I'm crossing my fingers that it works! If everything goes well, you shouldn't see any interruption! Otherwise, grab the new RSS feed link. Miss K can be a pistol sometimes. No matter how long we play with her, the minute we're done, she asks "Do you want to play with me?" When we tell her "Not right now, honey, we just got done playing with you." She sulks away muttering "Nobody is going to play with me" or "Who's going to play with me?" It's actually a really sad sight and sometimes works – which is why she continues to use it. Note to my future self: beware the teenage years when she has the whole guilt-trip thing mastered. As soon as we got home from the gym today, DH and I each got something to eat. Sometimes exercising makes me hungry and today was one of those days. No sooner do we sit down to eat when Miss K starts up her "play with me" macro. My mom had just called to tell us she was in the neighborhood and wanted to stop by. So I said to Miss K "Why don't you go stand by the door and see if anyone talks to you over there." I figured my mom would be arriving within a few minutes so it would work out. To our surprise, a few minutes later, Miss K shouted out to us "Nobody's talking to me here, either!" Thank goodness I was in-between bites because it totally cracked me up. DH was not so fortunate – I thought he was going to laugh his lunch out. At dinner time, the three kids (Miss M, Miss K and DH) were being ornery, in a fun kind of way. He kept getting them all giggly and when I wasn't looking one time, did who knows what to make it worse. I'm usually pretty uptight about dinnertime because the girls take way too long to eat and it drives me crazy. Tonight was a nice change to that. Miss M and DH were showing each other their teeth and Miss K joined in. I'm happy to report that nobody's mouth was full… except mine. So when Miss K asked me to show her my teeth, I covered my mouth and mumbled "I have food in my mouth." I tried to chew quickly and just as she started to say "When you're done eating…" I reached over and picked up my glass to drink. Without losing a beat, she restarted her sentence with "When you're done drinking…" It doesn't sound that funny on paper, but when we were sitting here, having a 3 year old switch so quickly to rephrase just tickled me. I had so much trouble swallowing that mouthful of milk that DH chimed in with, you guessed it, "Hey girls, watch milk come out of Mommy's nose." He was sooo close to right. I guess I deserved it for laughing at him at lunchtime. She's on a roll and I pray that she doesn't figure out that her whimsical little comments crack us up or we'll never be able to eat around her again! During the summer months, when I step out on my back deck, I see two trampolines, three swing sets and an inflatable water slide in neighboring yards. This past su mmer was the first time we felt the girls were old enough to play by themselves in the yard, so we spent some time trying to figure out what yard gear we should invest in. During a visit to see MIL in Alabama, we stopped in the Costco and found the coolest jungle gym – the perfect size for the girls. 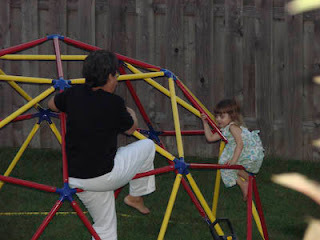 MIL purchased it, we brought it home with us, assembled it and watched the girls climb like monkeys. Here's a picture of MIL playing with Miss K during one of her summer visits. It hadn't been in the yard very long before DH's brain started churning. He said "It will make a cool igloo this winter." I thought he was joking at the time, but the more I thought about it, the more I realized he was right. It WOULD make a cool igloo. 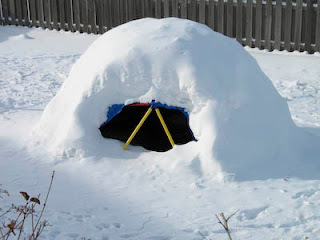 Personally, I've always thought it would be neat to have my own igloo! We had our first major snowfall and were not prepared for it. Our friend Mr. Jason lent us one of his tarps after we mentioned our plans. DH and I bungied it down and waited for the next major snowfall… Voila! And one more snowfall made it complete! 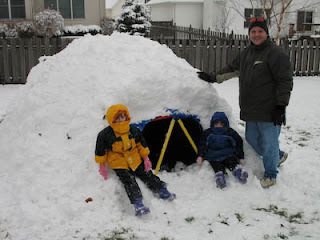 The weather is so cold right now that the kids haven't been able to enjoy it, but at least we have our own igloo now!